A copy of the plan for each of the three systems. At least one polystyrene ball with one half painted black and attached to a support (two balls may be allocated to each group: one to represent Earth and one to represent Venus). Before starting the lab work, photos of the phases of Venus may be projected. 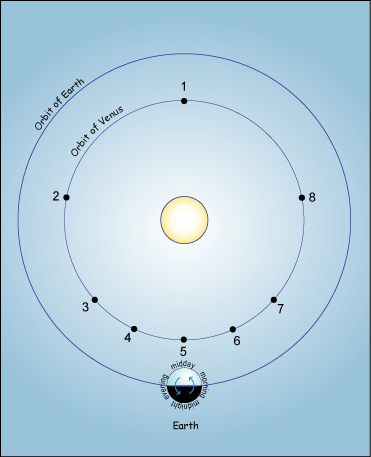 The Greeks, such as Ptolemy, (second century AD) believed that the Earth was fixed at the center of the universe, that the Sun revolved around the Earth and that the planets rotated in circles, the centre of which revolved around the Earth. In 1543, Copernicus published his "Revolutions of the Celestial Orbs" in which he explains that the Sun is the centre of the universe; and the planets Mercury, Venus, Mars, Jupiter and Saturn revolve around it. He specifies that the Earth is a planet like any other, and it too revolves around the Sun. In 1609, Galileo observed the sky through a telescope for the first time. Specifically, he discovered, craters and mountains on the Moon. In 1610 and 1611, he focused his telescope on Venus and observed phases just like those of the Moon: sometimes Venus looks like a quarter and sometimes it looks like a crescent. Can they be explained in the same way as the phases of the Moon? During that epoch, the Ptolemaic, Copernican and Tycho Brahe’s systems were in competition. The purpose of this experiment is to discover if they can explain the phases of Venus. Earth is the centre of the universe. Venus rotates on a circle, the centre of which rotates around the Earth. The Sun is the centre of the universe. 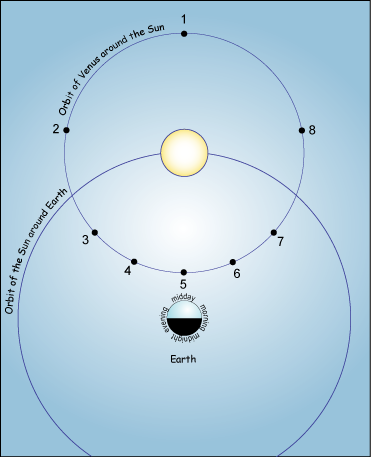 Earth and Venus revolve around the Sun. Earth is the centre of the universe. The Sun revolves around the Earth and Venus revolves around the Sun. Here, draw how Venus would be observed in each of these systems (only take into account the observed form, not the distance). The Copernican system like that of Tycho Brahe’ reproduces correctly what is observed. 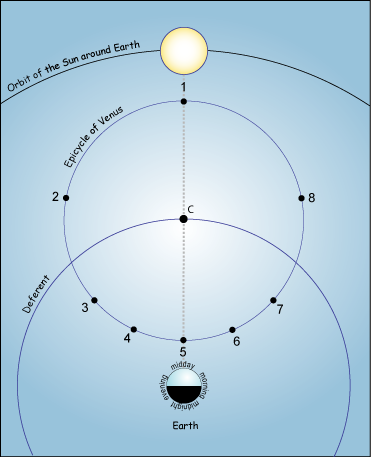 In contrast, the Ptolemaic system is incompatible with the observations.